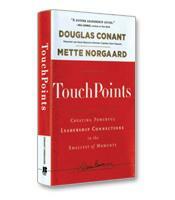 Douglas R. Conant, former CEO of Campbell Soup Company, and co-author Mette Norgaard turn conventional business wisdom on its head, suggesting that the daily interruptions that leaders face in nearly epidemic proportions are actually the moments where the greatest leadership opportunities lie. The TouchPoint model has three components and involves using the head, heart and hands to connect with employees in a way that not only enhances their individual performance, but actually transforms them into a valued member of the team. The three essentials of mastery. How to create your own unique leadership prototype. Why "walking the talk" is essential to your success as a leader. The four magic words of any TouchPoint.